three-video mini-series of Inspiring Stories. These have been great to watch so far and I hope you have enjoyed them too!! Well, today I am going to present the second video and this one is called "Give Joy". It is narrated by Alexa Vega. In order for your view of this video to count, you need to watch it in it's entirety. Domestic violence is a silent war that rages in and around homes all over this world and the victims need to know that we care!!! Show your support for this cause by taking a minute and watching this short film. It will inspire, amaze and encourage you to show others that you care. I loved watching this. Being that I am NOT a victim of domestic violence, it is hard to comprehend what it is like to live in a hostile environment where the one you love is hurting you. These women have truly overcome some great hurdles and I am impressed with where they are now. This was a great film!!! As with the other "Band Together" post from Mary Kay, this post also has a giveaway! 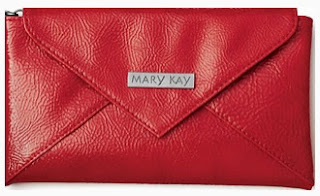 It will be the same prize, which is a red Mary Kay Beauty Clutch. Inside the clutch is a Mary Kay Lash Love Mini, a Bella Belara Fragrance Wand and a Beauty That Counts Sampler Card. This clutch has a retail value of $25. Here are your entry options! Watch the video above in its entirety, then leave a comment telling me something that you learned. :) You do not have to be a blogger to enter, but you must have a valid email where you can be reached should you win. If you do not leave an email address, it must be where I can easily find it. This giveaway is open to US residents and will end 11/2 at 11:59 pm EST. The winner will be chosen using random.org and will be notified by email. The winner will have 48 hours to respond, or another winner will be selected. 1. "Like" Mary Kay on Facebook. 3 entries, so 3 comments. 5. Blog about this giveaway. Leave me a DIRECT link to your post. 5 entries, so 5 comments. Disclaimer: I received no monetary compensation for this post. Prize is being provided through the sponsor. All thoughts and opinions are 100% mine. It was a really nice video about three women who were able to escape abusive relationships. It is such a horrible situation to be in. If you haven't been there, you really don't understand it. They are so positive now. The number one cause of injury to women is domestic violence. I am a fan of Mary Kay. I am a fan of Mary Kay on FB. I learned that you can never truly understand someone else's situation and it is possible for them to get help and be able to change their lives. Domestic abuse is the number one reason for injury to women. 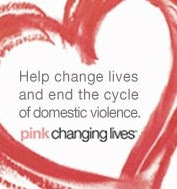 Also, for a limited time Mary Kay is donating a dollar from every lipstick purchase to stop domestic abuse. Liked Mary Kay on facebook. I learned that domestic violence is the #1 cause of injury to women. Great stories in the video. It really is a lonely place that no one understands unless you have been there. I like the message of 'joy' and having a vision that does that involve that abusive person and some perseverance. #1 I like MARY KAY on facebook as Wendy R.
#2 I like MARY KAY on facebook as Wendy R.
#3 I like MARY KAY on facebook as Wendy R.
Following @coupons4moms on twitter as @ArtsyChaos. Domestic violence can really effect anyone. I learned you just never know who could be a victim. I learned that domestic violence is the number one cause of injury to women; I did not know this!!! Crazy! I learned that 1 in 4 women will be a victim of domestic violence at one point in their lives. That number is should not even exist. They are raising awareness for domestic violence.